I’m not a fan of Hardware Lane. It’s the city version of the tourist end of Lygon Street: all pushy door staff and so-so food. But we like Golden Monkey, a rum bar at the top of Hardware Lane that hosts the Melbourne Rum Club, and we also love a good rack of ribs. And so we found ourselves on Hardware Lane on a busy Saturday night waiting for a table at Big Boy BBQ, “Melbourne’s first dedicated ‘low and slow’ smoked meat experience” in their own words. It’s a smallish place, wih seating for maybe 40 inside and another dozen outside. You order at the counter, your food comes out quickly with no fancy presentation, and drinks options are limited to a small fridge by the check-out. But boy is it worth a visit. 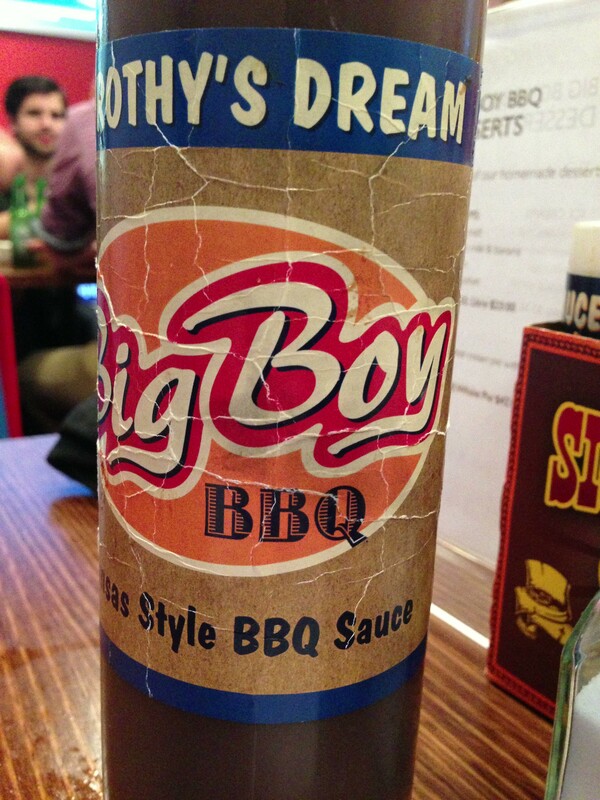 Big Boy offer sandwiches, ribs and barbeque meat all slow-cooked on the premises and served in generous portions. Sides are all-American diner fare, from deep-fried onion strings and coleslaw to the best smoked beef chilli in Melbourne – maybe even Australia. The platters are favourite though. The Little Girl and Little Boy serve 1-3 (they say), whilst the Big Girl and Big Boy serve up to six. All I can say is everything looked BIG. We played it safe with a ribs and wings combo: four decent-sized chicken wings and a half-rack of ribs (lamb or pork) with two sides, all sat on a few slices of white bread to soak up excess juices. The wings weren’t bad: we do really good wings at home so we rarely order them when we’re out. These ones were fairly well cooked and seasoned, with a trickle of Big Boy BBQ sauce to keep them moist. I wouldn’t bother with them again, though – in the end they just took up valuable stomach space. The onion strings were a tasty alternative to fries with the meal, picked up with fingers and dropped into our mouths like noodles. The smoked beef chilli was just the best chilli I have tasted in years, possibly ever: slow-cooked beef with brisket burnt ends, and plenty of bortlotti and kidney beans thrown in. Next time I’ll be super-sizing this particular side order. 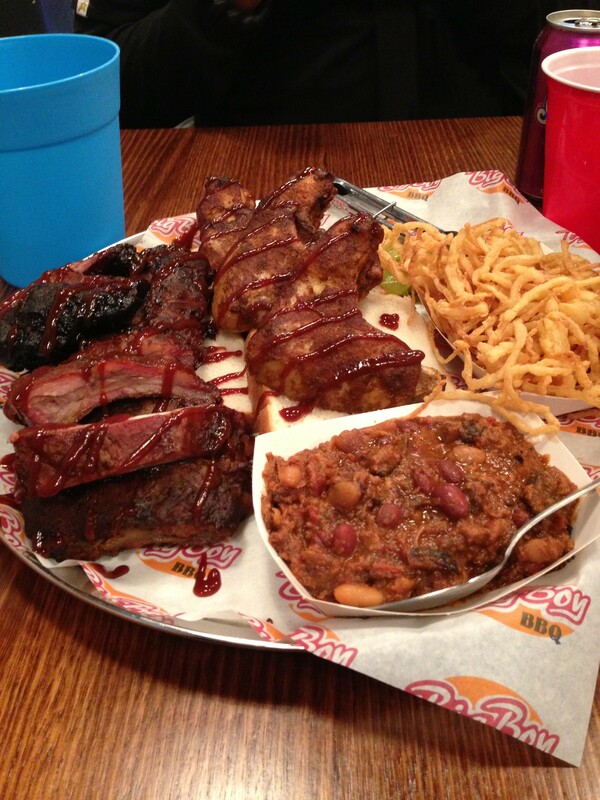 The ribs alone are worth the visit. We chose a half rack of Kansas City style dry rubbed pork, not too wet. There were about a dozen ribs, meat falling off the bone, a little bit spicy but not too hot. Finger-lickin’ good. Like I said, drinks are limited to a few cans, a few beers and one choice of white wine (750ml bottle) from the fridge, but BYO is welcomed at a dollar a head. Bottomless soft drinks cost $3.40. Desserts are limited but there’s always pie available. Big Boy call themselves “slow food, served fast” and it’s true – this is not a place to hang out and make an evening of the dining experience. But if you crave good old American barbecue, this is the place to be. You can always head on over to Golden Monkey afterwards and fill up on Hemingway Daiquiris and Wong Island Iced Teas. Bring your friends, and your own choice of beer or wine. Call ahead – they will take bookings occasionally. Get down there and feast. You won’t be sorry. Thanks for finally talkkng about >biɡ boy bbq | fill up on Ьread <Loved it!